This week I decided to pay the Gree a visit, for the first time in many months. I was quite astounded by the amount of stronghold decorations that had found their way onto the Gree reputation vendor since the last time I checked what he had for sale, and I immediately went on a spending spree. Who wouldn't want one of these cute little guys in their home? Of course, after that I was almost out of Gray Helix Components and decided to do at least a little work towards earning some more. The most useful idea I had in that regard was probably to coax my guild into running Xenoanalyst on both story and hardmode - boom, ten more components in one go! 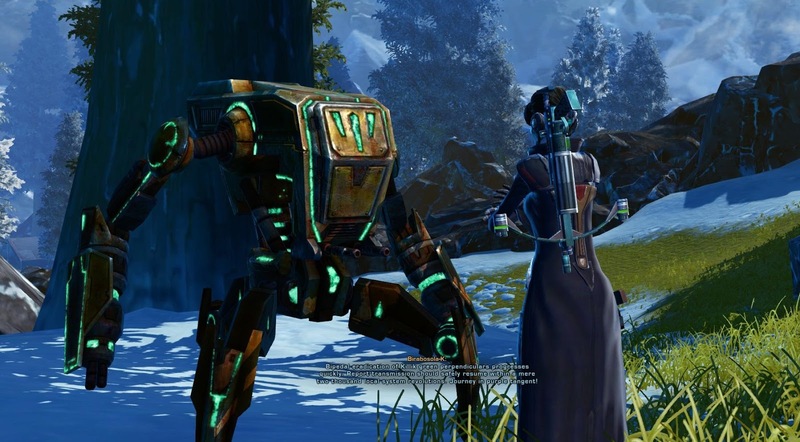 I also did The Ancient Gree Relays on two Imperial alts that hadn't done it yet, the quest to visit Gree droids on a bunch of different planets that rewards you with a pet, some rep and two more components. I was pleasantly surprised by the way level sync has spiced that mission up a bit, because apart from on Dromund Kaas, where the elite guards around the Gree observer are for some reason of a low enough level to be grey even to a level-synced character, I actually had to pay attention and fight smartly to survive four or five gold mobs throwing dots and stuns around, companions being overpowered or not. I was also somewhat bemused by their dialogue, much of which I'd already forgotten again. 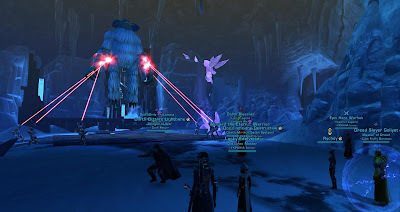 Apparently the Gree dislike Alderaan's Killiks and condone their "eradication"?! Yet they really like the Gormak on Voss... they sure have very peculiar opinions sometimes. 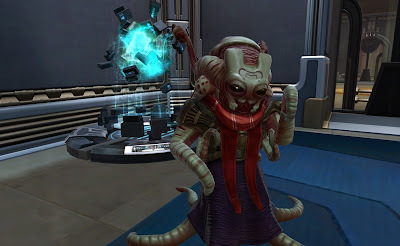 The decorations are the reason I'll need to spend a lot of time with the Gree! Unfortunately I'm moving this week, so I don't have a PC.